A quick-hitting, but potent, storm moved thru overnight and dropped a good amount of snow to many areas. We clear out today with a break in the action thru Wednesday. Next storm arrives late Wednesday thru Thursday with significant accumulations possible again. We interrupt your daily snow forecast with this amazing deal. Take your ski vacation to the next level and ride Snowbird's legendary terrain. 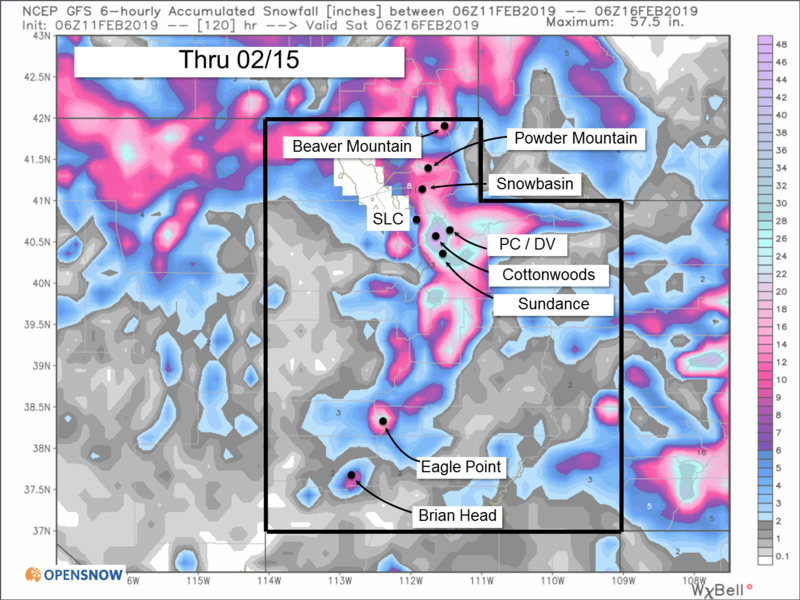 Over 120" of snowfall in January alone with more on the way! Receive the best deals on lodging and tickets. Stay at the mountain, be the first on the Tram and ride powder that's too deep for some to handle. Save money, ski more. The cold front pushed the yesterday afternoon and evening with its expected intensity and we saw very heavy snowfall for a few hours. The forecast was 6-12" with more possible in the Cottonwoods. Sure enough, most areas hit the range with a couple exceptions that didn't quite make it. The Cottonwoods reporting 11-15" this morning. The big winner was Brian Head in southern Utah where they are reporting 17" of snow overnight. A great powder day down there! There is still a bit of uncertainty about exactly how this storm will play out so we'll give it another day before putting together a specific totals forecast. However, it should bring good powder and Thursday and Friday. We remain generally active into the weekend but there doesn't seem to be much organization to any of these systems. We could just see chances for showers but nothing major. The storm door doesn't seem to close much at any point in the next 15 days so I wouldn't be surprised if we get additional storms into the region sooner rather than later.